Boston—Dr. Martin Nweeia and research colleagues cite new evidence of how "the most extraordinary tooth in nature" interprets its icy Arctic environment for the narwhal, the near mythological whale with the spiraling tusk that is a tooth 6 to 9 feet long. Dr. Nweeia views his explorations on the nature of teeth as relevant to the practice of dentistry. "The unusual properties of the tusk's microanatomy and expression give us a new perspective of teeth," he said of his narwhal tooth anatomy study published by the journal The Anatomical Record and first posted online March 18. "In my own dental practice, I am always communicating how unusual and sensory our teeth are in function. We all tend to get this passive sense of teeth as instruments used in biting and chewing and often forget their tissue origins and abilities as sensory organs." 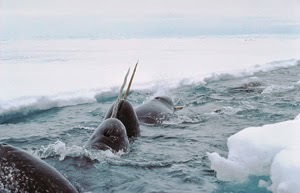 Speaking of sensory organs, Dr. Nweeia's narwhal research (visit narwhal.org for more information) reveals the sensory pathway between tooth and brain of the Arctic whale. The narwhal tooth system is a hydrodynamic sensor capable of detecting particle gradients, temperature and pressure and is able to detect high salt and fresh water gradients, the dental scientists reported.